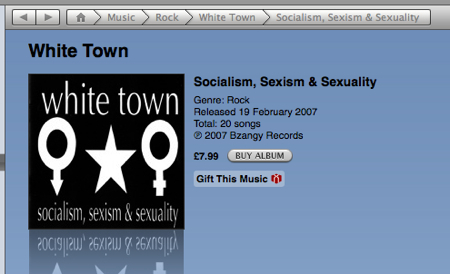 White Town – Socialism, Sexism & Sexuality now on iTunes! Socialism, Sexism & Sexuality now on iTunes! Yaaaay! At last, my 1994 debut album, ‘Socialism, Sexism & Sexuality’ is available on iTunes. Just click here! This album has been deleted on CD for ages but I keep getting peeps from this site emailing me about it so I’m thrilled it’s finally available again. God, it all seems so long ago! I was quite mental when I was putting ‘SSS’ together. If you’ve got the orginal physical CD with the booklet, this will be no surprise to you. Apart from a couple of spoken-word interludes, the album is just me, my crappy guitar playing, a TR707, some synths and a Tascam 688. Yep, it was all recorded on a cassette 8-track machine! The album is twenty songs of often unsettling intensity and… ummm… a personal nature interspersed with some lighter, sillier moments. I absolutely love it but that’s no surprise, is it? When I re-mastered the CD for this iTunes release, it was lovely to hear all those old songs and to relive all those horribly complicated, scarily joyful moments again.